Why are there always carrots when . . .? An interesting phenomenon to digest indeed. For years, many theories of the origin and intent of being able to emit carrots have been thrown up. These theories ranged from the carrots being an indication that you need stronger glasses to them being a sign of the curse of Cain (remember his downfall was sparked by an incident with carrots). It wasn’t until Jonah that the actual origin and intention of these carroty cubes was discovered. While Jonah was in the belly of the whopper, no doubt bored with playing “eye spy” and “go fish” with himself, his internal wonderings brought forth several intriguing discoveries. One was the ability to make a fish burp if you jump up and down in its stomach. Another was the discovery of a mouthwash that did wonders for the teeth, but not the breath. What we’re interested in though is the little door he found labelled “In case of swallowing, open door.” Upon opening this compartment (and whether it was really an emergency or not, we can ask him in heaven), Jonah discovered a bowl of steamed, diced carrots. It seems there is a special gland, what we know now as the swollowden starven gland, in the stomachs of living creatures for those who are, for whatever reason, swallowed alive. Such glands have since been found in the stomachs of sharks, crocodiles, dinosaurs and leaches. 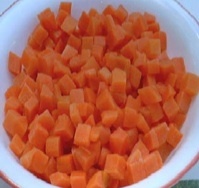 Scientists have since found that to keep the carrots fresh the reserves are emptied daily into the stomach, where they digest as normal food does. This means that if you happen to find yourself bowing down to your bathroom facilities in the hours after your gland has been cleansed, then there is a high possibility you will find the orange morsels materialising. My apologies for the unpleasantness of this topic but there are many things in life we have to deal with on earth until we get home—just like bellybutton lint. Interesting Fact: A carrot takes 70-80 days to grow to maturity—then they stop teasing the leeks about their name.